The Elstead Warwick Gothic 12 light large ironwork chandelier in graphite finish is handmade in England to the highest standards. This large heavy cartwheel chandelier features a heavy central drop rod suspended from matching chains and ceiling rose, with candle style lights around the cartwheel frame boasting metal candle pans and matching candle tubes. 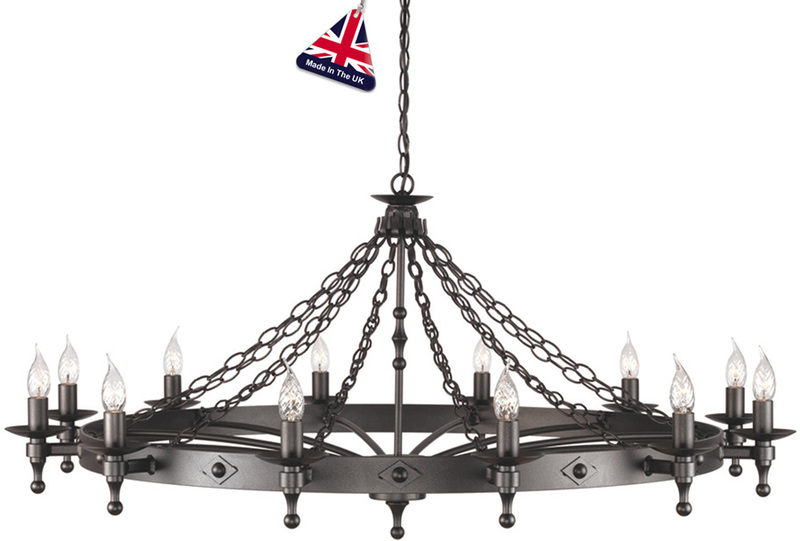 This is a large wrought iron chandelier that will require plenty of space and ceiling height to be shown at its best. Height adjustable at the time of fitting, please see the technical information for exact dimensions. The medieval styled Warwick range is heavy and hand crafted, designed to replicate the old wrought iron fittings of bygone days. Manufactured and designed exclusively by Elstead, these fittings are available finished in graphite black. This medieval style light is manufactured in England and supplied by Elstead Lighting, a British company that specialise in the manufacture and distribution of quality decorative lighting such as the Warwick Gothic 12 light large ironwork chandelier in graphite finish you see here.